Las Vegas is a city of high rollers and opulence. It's easy to drop hundreds or thousands of dollars - or more - here in a single day. But you don't have to spend a lot of money to have a blast. The city has countless free shows and attractions that rival the best paid experiences. "We've been here almost two days and have barely spent a penny, except for food," said Haymon Pierce, a tourist from New York City. "I love it! New York is wicked expensive." What is there to see and do when you're visiting with your pocketbook in mind? Any trip to Las Vegas would be incomplete without a stop at the Bellagio - particularly if you're on a budget. The famed resort is home to spectacular fountains and a stunning botanical garden that are free to view. 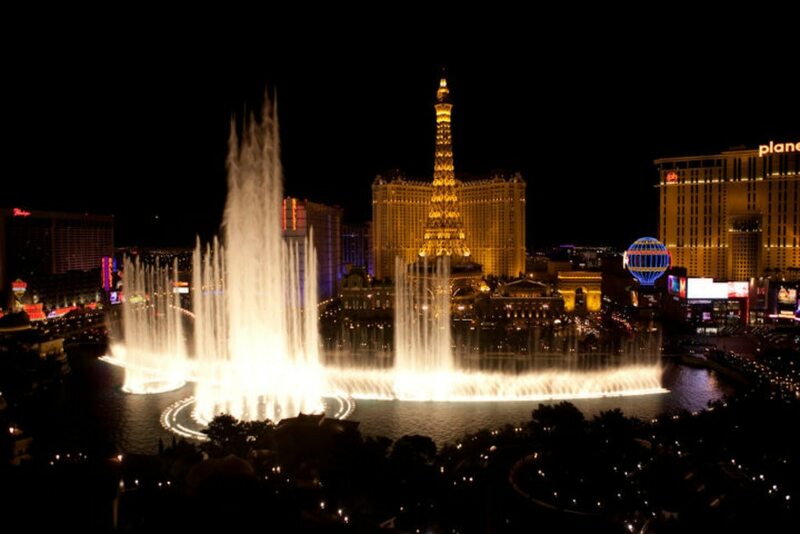 The Fountains of Bellagio are the resort's centrepiece. More than 1,200 jets nestled in a massive Strip-side lake shoot choreographed streams of water almost 500 feet into the air as a light show flashes and music plays. The show (which runs from 3pm to midnight on weekdays, noon to midnight on Saturdays and 11am to midnight on Sundays) features more than 30 songs from such Vegas favourites as Frank Sinatra, Elvis Presley and Tiesto. Even jaded locals have a hard time resisting letting out "oohs" and "ahhs" as the fountains dance. It's simply stunning. 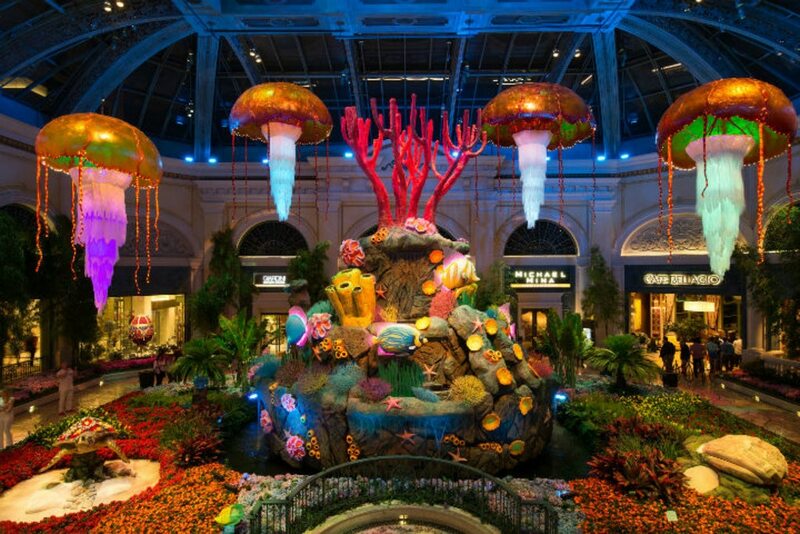 Inside the resort is the Bellagio Conservatory, a living paradise of plants, flowers and trees. The themed exhibit changes several times a year; this summer's theme is under the sea. On view through 12 September, the exhibit combines underwater and beach elements, including mermaids, sunken ships and sand castles. Schools of acrylic fish and barnacles float among a 26-foot-tall coral reef. There's a six-foot animated clam, a sea turtle made from carnations and mums, and jellyfish that hang from the ceiling. In total, the exhibit includes 6,000 flowers, 600 shrubs and 60 trees. It's a sight to behold. Better yet, two live musical performances are held daily at 4:30pm and 5:45pm featuring jazz instruments and symphonic harps. Down the street at theMirage Resort and Casino, a massive, man-made volcano erupts at 8pm and 9pm. Sundays through Thursdays and again at 10pm on Fridays and Saturdays. It's one of the Strip's most popular attractions and one of its oldest remaining. 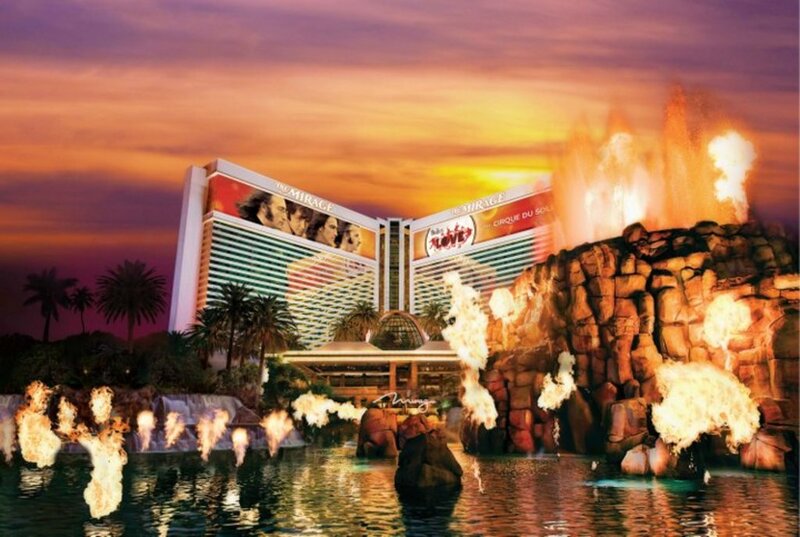 Set in a waterfall-laden lagoon, the volcano has been spewing fire and smoke since the Mirage opened in 1989. It received a $25 million facelift in 2008. The show is rounded out with tribal music and massive rumbles audience members can feel reverberating in their bones. 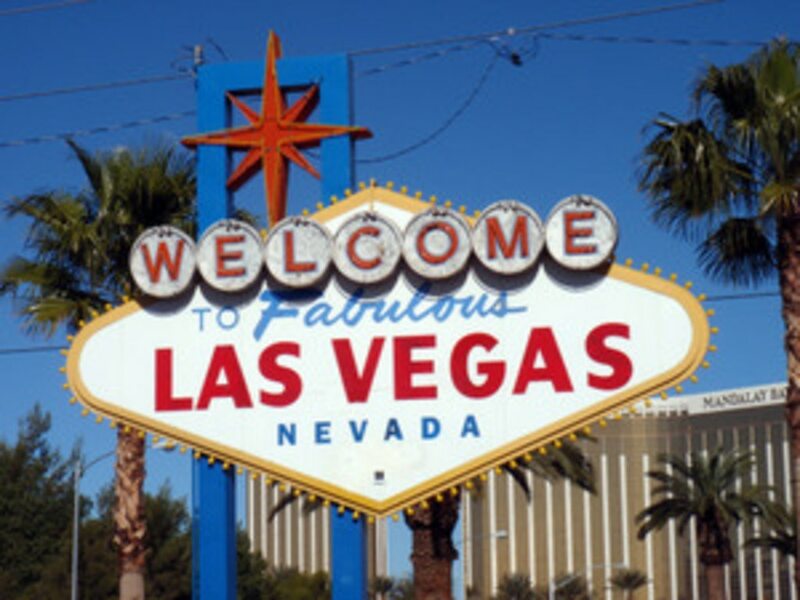 While you're on the south end of the Strip, be sure to stop by the iconic "Welcome to Fabulous Las Vegas" sign in the middle of Las Vegas Boulevard, just past Mandalay Bay. It's arguably the best backdrop for any selfie taken in the city. And don't fret if you want a group shot. There are tourists there all hours of the day and night willing to snap a few shots for you if you return the favour. 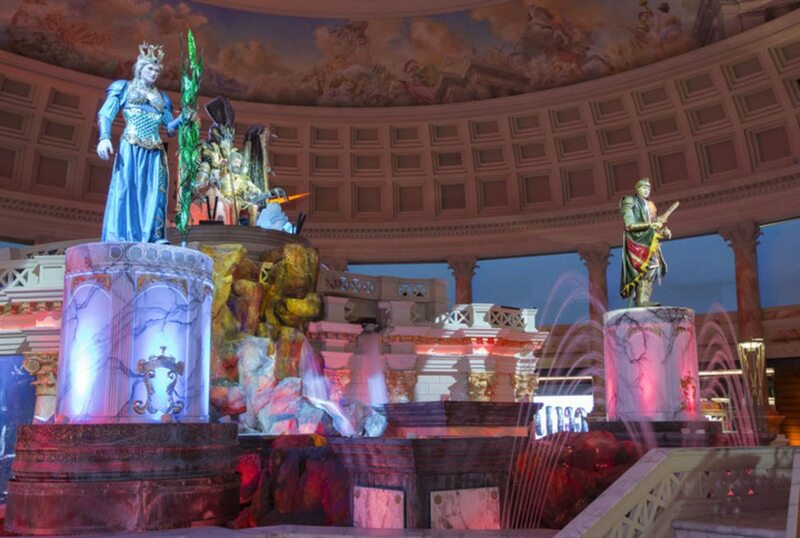 For a free animatronic show and a bit of history, visit the Forum Shops at Caesars Palace for the Fall of Atlantis attraction. On a stage surrounded by the mall's shops and restaurants, nine-foot talking statues narrate the story of a wild sibling rivalry gone wrong. The show includes a 20-foot winged dragon, fire and water - not things you see every day, even in Vegas. Nearby, also in the mall, is a 50,000-gallon aquarium with more than 300 saltwater fish. It's a great way to spend some quiet time away from the bustle of the Strip. "I've been to Las Vegas twice before, and I never knew these were here," said Angel Ocampo, of the Philippines, who took a break from shopping to watch the Fall of Atlantis. "I will definitely come back." Want to enjoy the city's free shows and attractions? Book one of our Las Vegas hotels and start planning your schedule.